AAUW is experiencing strategic change. Our new CEO Kim Churches has hit the ground running. She has instituted important changes in her staff at the national office so staff collaborate more effectively. She has also worked extremely hard to eliminate a planned deficit in the budget for this year and future years. One of the biggest tasks she has taken on is a new strategic plan for the organization. Kim and the Strategic Plan Task Force have solicited input from all levels of AAUW and outside of AAUW to ensure going forward AAUW leads on the issues most important to our mission. As members you too will have the opportunity to review the draft strategic plan and provide input from your perspective starting this Spring – please take advantage of this opportunity. For the state I am pleased to say that we have continued our critical focus on public policy led by our Public Policy Co-Chairs Ann Pehle and Barbara Price. This work is the heart of AAUW’s mission and our impact can be felt with events we organize and those for which we collaborate with other groups. Our endorsement of Fair Districts PA and The Committee of Seventy Draw the Lines PA is helping educate citizens across the state about gerrymandering. And, we keep up our efforts on equal pay, increasing the minimum wage, and other important issues for women with our efforts in Harrisburg and collaboration with the PA Campaign for Women’s Health. This year we developed two programs that we are offering to the branches which we will help plan and implement as well as fund. So far, a few programs based on the Deeper in Debt: Women and Student Loans have occurred, and next year we are eager to start offering the Draw the Lines PA contest throughout the state. Ann and Barbara have also compiled a myriad of resources on the state website that branches can use to do advocacy in their communities – big or small. The board continues to discuss the ways in which we can best serve our branches and its members. We are always interested in what our members think and need, so don’t hesitate to contact any of the board of directors with your thoughts. This report will be my last as President as I close out my second term in that office. I have left the business of the state in excellent hands with our next candidate for President and will continue to be engaged in the work of AAUW at the state level first as Immediate Past President, and then as a member. Thank you for what each and every one of you do to strive toward advancing equity for women and girls. More branches name Public Policy Chairs. 27 of 36 (75%) branches named a Branch Public Policy Chair. Increase from previous year of 55%. All branches were encouraged to report their Public Policy events and activities—anything pertaining to AAUW’s public policy mission. At the writing of this report, 21 branches reported at least one event/activity and 80 events/activities were held. Final summary and analysis to be added after June 30th. Supported branch events with localized action alert communication. This report was written prior to the event. Planning includes working with BPW-PA and the Pennsylvania Commission for Women as co-sponsors for the rally in the capitol rotunda. Also working with aides to Representatives Sims and Davis, co-sponsors of HB1243 the bill we will be lobbying on and aide to Representative Frankel the convener of the Women’s Health Caucus to secure the rotunda, the meeting room and plan the rally. All three representatives will be speaking at the rally as well as Representative Madeline Dean who will be speaking for the Commission for Women. The BPW legislative chair will also speak. Information about lobby day has gone out to all BPPCs and branch presidents. Through the action network an email to encourage participation in lobby day will go out to 5415 individuals. A flyer for the rally will be sent to members of the PA Campaign for Women’s Health, some of whom may be speaking at the rally. The Governor has also been invited to speak and issue a proclamation for Equal Pay Day. Increased number of statewide action alerts. June 2017 sent three email alerts on education funding in the proposed budget. Recognize Black Women’s Equal Pay Day in August. Oppose proposed property tax constitutional amendment on November ballot. Thank you to representatives who voted no on SB3-20-week abortion ban. Support SB215—women veteran’s license plate. Continued work with Pennsylvania Campaign for Women’s Health; Education Voters PA; and Fair Districts PA. Joined Pennsylvanians Against Vouchers to oppose SB2—Education Savings Accounts. Effort to work directly with persons in branches working on education issues to improve communication, understanding of issues, and our statewide impact. Conducted conference call with members who expressed interest in education committee. Provided resources and information to increase public policy acumen. Published Highlights in July, September, November, February, April. Conducted conference calls with BPPCs in August, October, January, March, May. Public Policy articles appeared in every Keystoner and FYI. Presented public policy priorities and resources at July 2017 summer retreat meeting. Website, while a bit outdated, still serves as a one-stop resource for members. Facebook page updated with branch events and news as well as information from coalition partners. Presented concurrent session at April 2018 annual convention – “Gerrymandering: Taking Away Our Voice”. Contributed to and edited power point on Deeper in Debt. Revised Public Policy priorities for AAUW-PA to be voted on at state convention. Responded to a number of requests for information and resources from members. Worked with AAUW public policy staff to arrange an event for members in the Pittsburgh area to hear from Anne Hedgepeth, AAUW Interim Vice President of Public Policy & Government Relations. No new schools became C/U partners in the last year. Number of branches with C/U chairs has changed from 11 to 9 since last year These include: Beaver Valley, Bethlehem, Carlisle, Easton, Huntingdon, Lansdale, North Hills (with two), Reading (with two) and West Chester-Chester County. Bradford and Doylestown dropped their C/U chairs. As of March 13, 2018 AAUW lists 454 total student affiliates attending colleges and universities across Pennsylvania, down from 511 last year. This lower number is likely related to the shrinking number of high school graduates and declines in college and university enrollment across the state. 379 student affiliates are listed as being PA residents; 28 of those attend an out-of-state school. Since AY2017-18 four new AAUW student organizations (SO) have been added at California University of Pennsylvania, the University of Philadelphia, Millersville University, and Lehigh University. Penn State University-University Park dissolved their student organization in fall 2017. This puts the total number of SOs in PA at fourteen: California University, Delaware Valley College, Dickinson College, Gettysburg College, Juniata College, La Roche College, Lehigh University, Lock Haven University, Millersville University, Moravian College, Penn State—Behrend, University of Pittsburgh, University of Philadelphia, and West Chester University of PA. Both the West Chester and Gettysburg SOs appear to be in a state of inactivity and very little info on what’s happening at PSU-Behrend is available. Shaina Hilsey, a senior at the California University of Pennsylvania, was selected to serve on the 2017-18 national Student Advisory Council. She also serves on the AAUW-PA Student Advisory Council for 2017-18. The state-level Student Advisory Council (SAC): This group planned the student panel for the state annual meeting in April and helped plan the student session on financial literacy. Ideally, the Student Advisory Council has five members: one from each PA district and two at-large members. This year we selected four members, who are listed below. 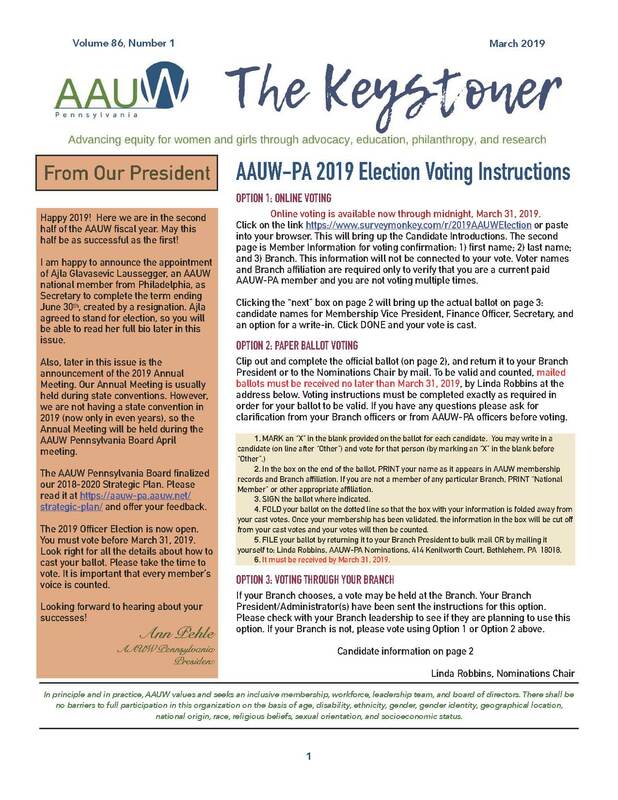 Since AAUW-PA will now alternate the years for state meeting, the executive board has a very important question to address. The SAC’s major role has been, in the past, to design and organize an event for the annual meeting. This change means that in off years that there will be little for them to do. What should their role be in the future? Bria Bowman is a senior at West Chester University majoring in International Business Management. Bria is active with the Golden Rams Society which represents the WCU student body to external groups and generates support for student services. She is also a Resident Assistant and attended the Diversity Youth Leadership Conference at Bloomsburg University. Natalia Hazelwood is a senior majoring in International Relations with the Penn State University World Campus. During 2016-17 she was a program facilitator for Ignite National, a training program for girls interested in entering politics. She is currently partnering with the Texas Network of Youth Services to advocate for children in the foster system, and she is on the Student Advisory Board for the Campus Vote Project. Shaina Hilsey is a senior year California University of Pennsylvania majoring in Sport Management with a concentration in Professional Golf Management and a minor in Business Administration. She serves as an appointed student representative on the PASSHE Board of Governors. She was awarded an AAUW-PA grant to attend NCCWSL in June and was inspired to create a student organization at California University. She also serves on the national Student Advisory Council for 2017-18. Sofina Odero is a senior majoring in Africana Studies and minoring in Health Studies at Dickinson College. She currently serves as the vice president of the Black Student Union at Dickinson, is involved with various non-profits, and was recently accepted into Teach for America. During the past year, I have continued to be available to branches for questions and concerns regarding their branch records. Most were handled via email and phone, although I remain available to travel to assist your branch in sorting, organizing and storing branch records. I also compiled a list of AAUW-PA Awards and the list can be found on the website. I researched this information using state and branch records. Any discrepancies, please contact me and I will review. My next project is a review of branch Date of Recognition and Disbandment. AAUW—PA had 80 branches and had great influence over women’s rights and issues in local communities. Some information has not been retained. Please feel free to contact me at any time for additional assistance. Our history is very important to all of us. Pennsylvania has had a strong year for membership development. Fifteen branches increased their membership totals and two branches maintained their numbers. AAUW-PA’s branch membership is holding steady at slightly over 2000. Thirty of our thirty-six branches recruited new members for a total of 189 new branch members. How has this been accomplished – through enthusiasm, diligence and hard work of all members who promote the greatness and the benefits of belonging to AAUW. Branches combined mission-based programming with outreach to recruit new members. Many branches use AAUW’s Shape the Future Campaign, during which new members can join AAUW for half price national and state dues. Pennsylvania’s e-student affiliate total continues to grow as more branches reach out to C/U member colleges to collaborate with programs and voter registration drives. Student Affiliates owe no state dues for the entire time they are enrolled in college. New this year: graduate students may join AAUW as student affiliates. With the graduation season upon us, now is the time to consider Give-a-Grad-a-Gift. It costs you nothing, but gives plenty to that special graduate. Any grad joining a branch in PA owes no state dues that year. This year AAUW-Pennsylvania continued its recognition of branch achievements via the Branch Highlight program. Nine branches have shared summaries of events, processes, changes or initiatives that strengthened their branch in many diverse ways. Since 1979 AAUW-PA has provided branches a platform with which to recognize branch members through the Outstanding Woman program. In 2012 AAUW-PA created the TEAL award to honor branch members who made a big difference to branches during the past year. The TEAL award was renamed Member Making a Difference in 2016. Both member recognition programs have been well-received by all branches. Congratulations to all twenty-four Outstanding Women and twenty-one Members Making a Difference in 2018. What ideas are you planning to use to recruit, engage and retain your members? How can your branch increase its outreach next year? The membership initiatives your branch chooses to focus on are not as important as how you choose to use them. Please, please plan some neat things and share them with me so that I can share them with all branches. Membership is everyone’s job. Thank you for everything you do for AAUW-PA. And thank you for giving me the opportunity to help you and AAUW shine.